The sun is finally shining, but I’m still recovering from a week long flu, so my husband was instrumental in getting this off the ground! He whisked 2 eggs with salt, onion powder, chipotle, and baking powder, and then poured them into individual black ramekins. 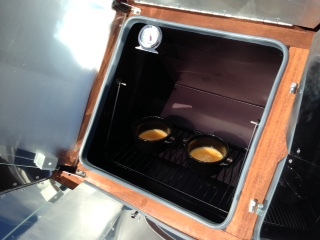 He placed the ramekins into the Sun Oven at 10:30, after allowing the oven to heat up for 20 minutes. The temperature outside at this time was 19 degrees F, and winds were 11mph. It was 200 degrees F inside the Sun Oven. The temperature continued to rise throughout the hour the eggs were in, until it was almost 300 degrees F when we took them out at 11:55. The results were a baseline: They were crispy around the edges and a bit runny inside still, but everyone seemed to like them—if they weren’t so spicy. We feel that forty-five minutes to an hour should be enough to cook these eggs if we had allowed the oven to warm up more, or if it were summer, but that’s something to be tested at a later date!